Shizu Okusa, co-founder of JRINK, talks trading Wall Street for DC entrepreneurship. Shizu Okusa and Jennifer Ngai started JRINK Juicery, their DC cold-pressed juice company, while working full-time at the World Bank. About six months later, in January 2014, they made the leap to full-time entrepreneurship. They use a cold-press process, with a high-pressure hydraulic press, to extract juice without breaking down vitamins and nutrients. There is over a pound of produce in each bottle of JRINK, making them ideal supplements for District residents trying to clean up their diets. Other health-conscious customers use JRINK for juice cleanses or as meal (or coffee) replacements. Less than two years since its co-founders became full-time, JRINK has grown exponentially, with four current stores and three more set to open by early 2016. The company also has a killer social media presence and has recently expanded into healthy trail mixes. Okusa met and befriended Ngai, her future co-founder, when they were both working in finance at Goldman Sachs in New York City. Over time, the pair realized the frantic Wall Street lifestyle was not a fit and, in 2013, moved to DC to work at the World Bank. While there, they started making juices to have a portable, healthy snack to bring to work. Okusa says juicing allowed her to tap into her creativity, and she enjoyed making tangible products by hand. Okusa and Ngai shared the juices with friends and began developing new recipes. It was the start of JRINK. 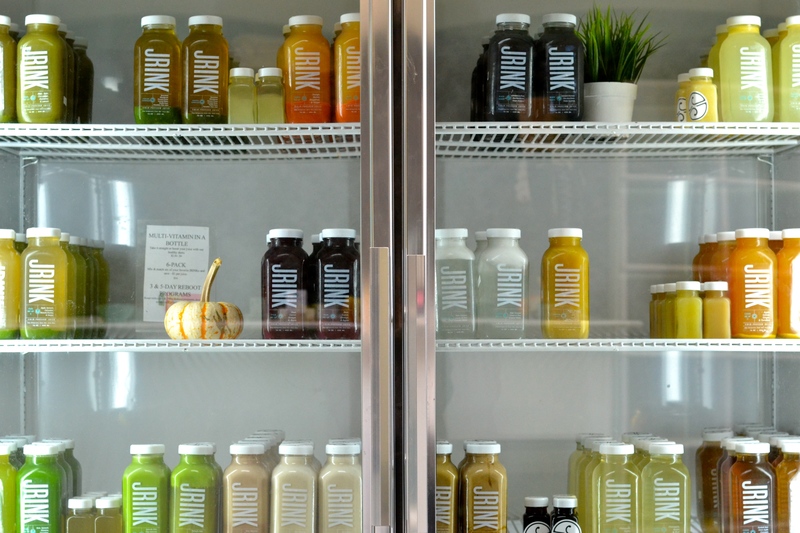 They conducted a market assessment and confirmed a need for pressed juices in DC. Okusa notes that she thinks the company was unique in DC but wouldn’t have worked as well in New York City’s market, which was already saturated with juice shops. The co-founders reached a tipping point. They worked 9-5 at the World Bank and dedicated nearly every other available hour to their growing business. JRINK, she said, was becoming full-time. In January 2014, Okusa and Ngai officially quit their day jobs, wrote a business plan, and focused on growing JRINK. Business savvy is also critical. Okusa says it’s important to let numerical analysis and not just passion inform business decisions, such as JRINK’s market analysis before launching in DC. Relationships are crucial. Starting a young business with a co-founder and business partner has helped Okusa “be a better person.” She says she’s become much better at both giving and getting feedback since launching JRINK. Knowing your management style is important. With soon-to-be seven stores throughout the DVM, she notes that it is sometimes challenging to incorporate and get buy-in from all employees. Portrait courtesy of S. Okusa. Other photos by G. Byrd.